Located a short walk away from the historic Market Square of Lviv in West Ukraine, the ICONART Contemporary Sacred Art Gallery occupies two storefront rooms on a side street of the city's old Armenian quarter, now full of trendy art venues and outdoor cafes offering beer from micro-breweries. A mostly young crowd of art lovers gathers on a pleasant summer evening for the opening of the solo show at ICONART of Lviv Painter Natalya Rusetska on the theme Agape: From Creation to Salvation. They fill the small exhibition space and chat in groups in the pedestrian zone outside. I have come all the way from the American Midwest to join them. In the Rusetska exhibition, a row of uniformly sized panels painted in muted colors depicts the first six days of Creation, displaying painstakingly lined figurarive forms on geometric backgrounds. The seventh day is illustrated by an ethereal icon of Christ in Glory, preparing the viewer for images of the Passion. Christ as both the maker and redeemer of the universe appears in a stylized Crucifixion scene set among the wonders of Creation, bringing together the themes of the show. Abstract modernism combines here with the detailed markings of manuscript miniatures. Galleries featuring modern sacred art are a rare commodity. One specializing in contemporary iconography is a Pearl of Great Price, and I had found it in West Ukraine. The ICONART website came up one day during an internet search for modern Madonnas. Looking at holy images in various modern styles, often made on unusual grounds like glass, “found” objects, and metallic tapestries, I realized the special role this gallery in Lviv could play in pushing the boundaries outward of a conservative sacred art form traditionally based on the copy of historic prototypes. This was worth a pilgrimage to the old East Bloc. That Lviv should be the home of an experimental school of iconography came as no surprise to me. Known, variously, as Lwow, Lemberg, Lvov, and, now, Lviv, the city has been a historic crossroads of different cultures ruled (and occupied) in modern times by the Poles, the Austrian Habsburgs, Tsarist Russians, the Nazis, and Soviet Communists. It also lies on the boundary where the Byzantine East meets the Latin West. The dominant faith in the region is Ukrainian Greek Catholicism, which claims allegiance to the Holy See in Rome but follows the Eastern Orthodox form of worship, including the veneration of icons. Stalin was suspicious of this “Latinized” Orthodox faith community with links to the Vatican. When these once Polish regions of West Ukraine were annexed by the Soviet Union at the end of World War II, the Kremlin engineered a one-sided merger of the Ukrainian Greek Catholics with the Russian Orthodox with Ukrainian church property (and its sacred art holdings) passing to the Moscow Patriarchate. Greek Catholics worshipped in the underground for almost 45 years, until Mikhail Gorbachev restored their legal status in 1989. The new iconography is playing a key role in helping Greek Catholics revitalize a culture of sacred art-making all but lost to them during a half century of Soviet persecution, when the only images most of the faithful kept were holy cards in a syrupy-sentimental French Catholic style. There are schools in Lviv teaching traditional iconography, where students replicate sacred images of the 15th century—considered the Golden Age in Ukrainian liturgical art—working from photo enlargements of historic originals. The new iconographers use such time-honored techniques in distinctly individual ways. Contemporary icon-makers in Lviv take inspiration from a wide variety of sources in what was once an eclectic pre-World War II sacred art scene, where holy image-makers worked in Viennese Secessionist, Symbolist, Art Nouveau, Neo-Byzantine, Art Deco, and early Modernist styles. Most of the new iconographers are graduates of the Sacral Art Department at the Lviv National Academy of Arts, founded and directed by Iconographer Roman Vasylyk, where they learn traditional icon painting with tempera on wood, plein air painting, life drawing, mosaics, encaustics, icon-screen design, and fresco and grafitto work on plaster.. The best place in Lviv to see the new sacred art on public display in its many variations is ICONART, the brainchild of local businessman, Kostyantyn Shumsky. He was interested in buying a contemporary Greek Catholic icon and turned to art historian and theologian, Markiyan Filevych, for advice. They both saw the possibilities in creating a special niche art venue in Lviv, devoted to a type of modern sacred imagery, different from traditional church art. ICONART opened its doors in 2010 with Shumsky as owner and Filevych as curator—a display of commercial daring-do unimaginable these days in the secularized West. In my internet visits to the gallery, I was particularly impressed by the number of women icon-makers in its listings and by the works of four artists, in particular—Rusetska, Ivanka Demchuk, Ulyana Tomkevych, and Lyuba Yatskiv. (There are now enough pieces by them in my collection to send an exhibition of Women Icon-Makers of West Ukraine on the road!) I wondered if this was a new feminist sacred art school in the making but learned in Lviv that women have always been anonymous icon-makers. The new freedom to pursue individual styles and sign pieces has simply brought them out of the shadows and won them long-denied recognition. You can line up four modern icons by four different artists in the traditional style and they would be more or less the same in appearance with subtle individual variations. There is no mistaking who has made what piece in comparing four images of the Virgin Mary in my collection by the quartet of new women iconographers from Lviv. Yatskiv offers an intriguing variation on the historic prototype of the Virgin Who Shows the Way, where an older Christ child turns toward his mother in holy conversation. Demchuk gives us a mysteriously half-hidden Madonna and Child enveloped in incised gold decorations suggesting the art of Gustav Klimt and the Vienna Secession. In two Nativity scenes, Tomkevych and Rusetka both follow the Orthodox iconographic tradition of depicting the Virgin Mary stretched out on the ground after giving birth to the Christ Child. She is seen in splendid solitude in Tomkevych’s variation, "pondering all these things in her heart" on a carpet decorated with Ukrainian floral folk art designs. Rusetska emphasizes the importance of the Incarnation of God for the entire cosmos in her icon of the Birth of Christ, a theme central to her summer solo exhibit, showing the characters from the Nativity narratives on a planet Earth suspended in space. Yatskiv works in a style conforming more closely to the traditional Byzantine manner. She is an intuitive artist who begins with free sketches and adapts them to historic prototypes, creating long,sinous lines, which extend and bend holy figures in expressive ways. Her large panel painting of Christ Ruler of All in my collection offers a strikingly new variation on a prototype seen in a 13th century mosaic in the Hagia Sophia (Holy Wisdom) church in Istanbul. In contrast to the traditional static frontal image, Yatskiv offers us a dynamic Savior in three-quarter profile who still engages us with his eyes. His hair and garments seem numinously wind-blown. The same warm palette of fire and earth tones and decorative Eucharistic motifs appear in a companion piece of the Virgin Who Shows the Way. Tomkevych makes icons that are neither 15th century replicas nor ultramodern. Trained as a watercolorist she works with a visually pleasing color palette drawing on Ukrainian folk art motifs. Images showing a central portrait of a saint, fixed in eternity, framed by tiny visual vignettes from their lives are a popular genre in Orthodox sacred art. In Tomkevych’s icon of the Life of St. Nicholas, she shrinks the size of his heavenly portrait to focus our attention on the earthly miracles and good works of this much-loved intercessor. Patterns from traditional Ukrainian embroidery appear on the table cloth in Tomkevych’s variation on the Last Supper. 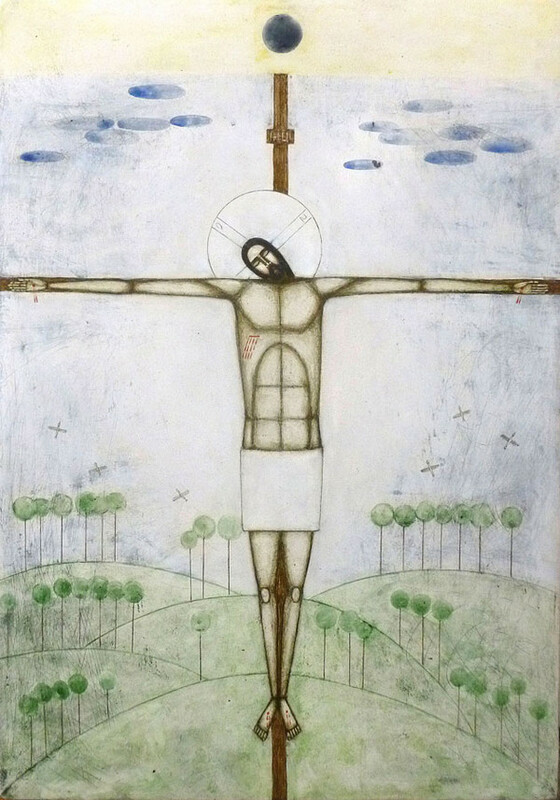 Tradition and modernity come together in Tomkevych's contemporary depiction of an ancient prototype of a miraculous image of Jesus known as the Savior Made Without Hands, which Christ is said to have left on a towel, sent to heal the ailing Syrian King of Edessa. Tomkevych uses variations on the traditional blue and red palette of Christ imagery in subtle and expressive ways in this unusual portrait in the round, reshaping the cloth on which the holy image miraculously appeared into the Cross. The youngest of the four women icon-makers, Demchuk is an artist in search of a style. Moving on from the fin de siècle Viennese icon of the Madonna and Child, Demchuk created a fully embodied Christ more typical of Western art of the Passion in her icon of the Holy Shroud, a cloth with an image of the Dead Christ used in the Good Friday liturgy of the Eastern Orthodox Church. In her most recent works, Demchuk has moved toward an abstracted mystical style, paying homage to the famous Andrei Rublev icon of the Holy Trinity in a vision of diaphonous holy beings in a white celestial space. My visit to Lviv opened my eyes to holy images by so many sacred artists working in a such a variety of styles, I willingly abandoned my original goal of creating a collection devoted solely to the women icon-makers. After Iconographer and Curator Roman Zilinko took me on a tour of the outstanding Ukrainian liturgical art collection, dating back to the 12th century at the Lviv National Museum, I was drawn to his folk-art styled variation on The Savior Made Without Hands, where the miraculous image of Christ is shown on a cloth with traditional Ukrainian embroidery. Arsen Bereza, the husband of Demchuk, introduced me to iconography on “found” objects like his rusted Crucifixion scene. His own variation on the Christ of Edessa theme is painted on a recycled piece of wood. The face of Jesus is modeled on the famous 15th century Christ of Zvenigorod icon, attributed to Russian Iconographer Andrei Rublev, which was discovered in a firewood pile a few years after the icon-wrecking campaign of the 1917 Bolshevik Revolution. I walked with Iconographer Sviatoslav Vladyka through the the Church of the Nativity of the Most Holy Theotokos, by all accounts the best example of new sacred architecture in Lviv, looking at his light-filled interior decorations in a harmonious Art Deco style. I was intrigued to discover this new icon-maker saved his most radical designs for individual pieces like his modern variation on traditional iconography of the Nativity. In Vladyka's reworking of the ancient Easter theme of the Myrrhbearers, the exposed grain of the wooden panel takes the place of background gilding. Vladyka's various images of Christ could be the work of different artists. His King of Glory icon presents us with a Shroud of Turin-like photo negative image of the bruised and battered body of Christ, seemingly imprinted on a black, red, and white geometric study typical of the Kyiv-born early Modernist Kazimir Malevich. He pays homage to the protestors in the February 2014 Revolution of Dignity in Kiev, Ukraine, which brought down the corrupt regime of Pro-Moscow President Viktor Yanukovych in a variation of The Savior Made Without Hands image, where the face of Christ is partly concealed in a blood-soaked mask, protecting from tear gas, and bullet shell casings embedded in the wood form a halo. Once viewed as the special sacred art form of the Eastern Orthodox, icons have made an ecumenical move in recent years into the life and worship of Roman Catholic and Protestant communities with liturgical traditions and have even found a place among Emerging Church groups. Expanding the range of prototypes of Christ, the Virgin Mary, angels, saints, and key moments in sacred history can only make these images, which are uniquely created for personal prayer and corporate devotion, more accessible to larger numbers of Christians—a development in sacred art-making, surely, worth celebrating in the universal church.